"Yuh fired!" "No, YUH fired!" Raise your hand if you think of firemen and fire trucks whenever you see a dalmatian. Well fear not, for I am hear to explain all. The dalmatian isn't that old of a breed. They appeared sometime around 600 years ago in the Dalmatian region of the Adriatic coast. They are known for being a breed that can run for long distances without tiring. As fire departments started expanding, teams of horses were required to haul the equipment. In both England and America, fire departments started using dalmatians to protect the horses at the fire house. But, that wasn't the only job the dogs did. When an alarm was sounded, the dalmatian was the first one out of the fire house, and he or she would be barking for all they were worth. They would then trot ahead of the fire equipment, barking the whole way. They were a barking siren warning people to get out of the way. And, when they got to the fire, they still didn't get to rest. Horses are, by their nature, afraid of fire. (most animals are). However, due to the strange ability to calm down the horses, if the dalmatians stayed nearby the teams, the horses were fine. And, if all that wasn't enough, dalmatians are expert rat catchers. For them, catching and killing a rat is like a game. They can't get enough of it. And, back when they first started working for the fire departments, rats were common. There is a common myth that all dalmatians are deaf, and that means they aren't disturbed by all the whistles, yelling, clanging of bells, and general hullabaloo that accompanies a fire. Well, like all purebred dogs, due to inbreeding, they are more susceptible to certain medical conditions, including deafness. But not all dalmatians are deaf. Not by a long shot. So, that's just an urban legend. 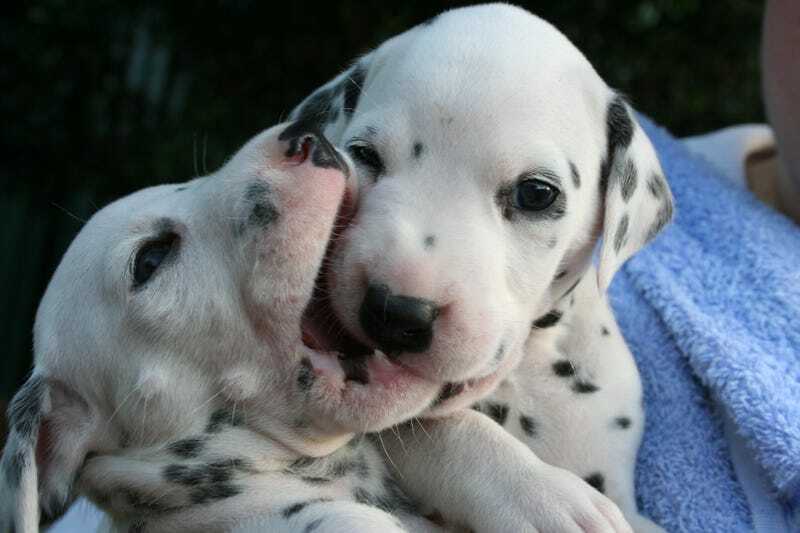 Now, I know you think dalmatians are cute as puppies, (hey, what puppy isn't cute? ), and they make for a very handsome adult. You should know that they are very active. As in, they make a Golden Retriever look like a couch potato. They need to run. A lot. Every day. If you run 5 miles a day, you might be ok with a dalmatian. Anything less and don't consider it. Because when they don't stay active, they become bored. And when they are bored, they get destructive. Like, chew up the furniture and eat the cupboard doors, destructive. So, next time you see a dalmatian with a fire department, be advised, it's a working dog.